The house is located close to Cartmel and Grange Over Sands in the village of Allithwaite so there are a number of churches you might be considering to hold your special day – or indeed you could have a humanist ceremony on the lawns of the house. 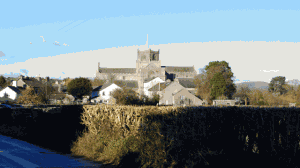 You might have been lucky enough to secure in a place St Mary’s Cartmel and are looking for a house nearby to rent. Or one of the many other churches nearby. The kitchen can be used to cater for the a reception at the house if you wish, or we can arrange for outside catering so you don’t have to worry about it. There are a number of catering options including The Pheasant Inn which is well respected and they cater things like Cartmel Races. We can arrange that for you if you give us plenty of notice. The house is large and spacious, sleeping up to 14, with large entertaining spaces so can be used a perfect hub around which the wedding can gather. While the house has a homely feel, there are plenty of rooms that could be used for more entertaining around the wedding day. Including the conservatory and the lounge. The BBQ on the patio is also a great space to eat and relax if you want to mingle with the in-laws and share a few drinks under the vines of the veranda. We are not a 5 star hotel, we are a traditional house, but if you’re looking for something more informal we could be what you are looking for. There are plenty of snazzy restaurants such as l’enclume nearby. We also have some very friendly pubs nearby to help with the entertaining options. The house is also well connected being minutes from the A590 and the train line at Kents Bank and importantly, the house has plenty of parking space too so all the guests can fit in. Please do get in touch and we can work through a package that would suit your needs.